Something unique has happened in New York: a wave of low-wage worker activity. As is clear from this report, New York City is at a critical turning point: will the City be one where all working families can find stable, living-wage employment? Or will the entrenched inequality of the City worsen still further? This report captures the inspiring stories of low-wage workers who have put these issues in the spotlight, organizing for improved conditions in industries ranging from car wash to fast food to retail and beyond. It is our hope that this report will help elevate the issues raised by these workers as New York prepares to elect a new City Council, a new Mayor, a new Public Advocate, and a new Comptroller to take office in 2014. Although New York’s economy has begun to recover from the Great Recession, working New Yorkers continue to face serious challenges. Despite the significant rise in workers’ productivity over the past forty years, their wages have remained stagnant while those at the top of the economic pyramid have reaped nearly all of the benefits of our growing economy. When the recession hit in 2007, it exacerbated an already dire situation for working class and impoverished New Yorkers. Manhattan’s inequality is higher than all but one other county in the nation and approximately equivalent to that of Bolivia. As troubling, the growing sectors of the New York City economy, such as the growing service sector, feature low-wage, no-benefit jobs, with little hope for upward mobility. This is a familiar narrative. But the next act is inspiring and a cause for hope: 2012 was a year of unprecedented activity by low-wage workers in the service industry, including strikes, rallies, marches, and union organizing. 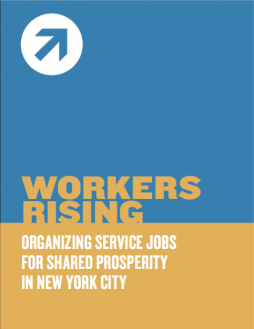 New York’s service workers are rising and fighting back – as their predecessors did in the 1930s – against poor working conditions and poverty-level wages. Despite the real risk that speaking out may cost them their jobs, thousands of workers in New York City’s lowest wage industries are joining together to demand dignity on the job. At car washes from Elmhurst to So-Ho and Jamaica to Mott Haven, immigrant car washers have voted to unionize. At fast food restaurants from Times Square to Fulton Street in downtown Brooklyn, protesting workers have made national news by taking on and striking some of the biggest employers in America. At flagship Fifth Avenue retail stores, cashiers are calling for an end to the part-time poverty that plagues the industry. And at JFK Airport, the men and women who keep millions of travelers safe have united to demand better training, higher pay, and health insurance so their families can be healthy and safe as well. These workers’ bold actions, sparked, we believe, by the energy and anger and hope of the Occupy movement, have amplified the call for change – and broadened it to make clear that this is a fight for all New Yorkers. City’s home rule power so that it can create a City minimum wage that reflects the higher cost of living here, as compared to upstate. The New York City Council also has the power to reshape our economy in meaningful ways. Improving the jobs and lives of low-wage workers is not only an issue of justice, but also an issue of good economics. If low-wage jobs were to be transformed into middle class jobs, workers’ higher wages would allow them to spend more on local goods and services, giving a boost to the economy that our city’s neighborhoods could desperately use. In 2013, New York City voters will elect a new mayor and fill every seat on the New York City Council. Over the coming four years, these elected officials will make critical decisions impacting the lives of millions of people. But our future is not in their hands. It is the politicians’ future that is in ours. Will our next mayor continue programs that deliver tax breaks and subsidies to large corporations that do not deliver on promised job creation? Will our next City Council finally pass key reforms – such as legislation to provide paid sick leave to the City’s workforce – that can improve the lives of low-wage workers and their children? Will New Yorkers and our elected officials build a City in which all working families can thrive? In large part, the answers will depend on the choices that elected officials and voters make over the coming year. First, the City should raise standards for low wage work by passing legislation to guarantee at least five days of paid sick leave for workers – such as the Earned Sick Leave Act – and to protect workers from erratic and unpredictable scheduling that keeps them in poverty – such as the Predictable Scheduling Act. Second, New York should regulate high-violation industries where wages are low and labor abuses are rampant by passing laws like the Car Wash Accountability Act and establishing an enhanced privilege permitting system at Port Authority airports. Such policies should impose new licensing or permitting requirements, tighten environmental and safety standards, and implement other tailored policies that increase oversight of the lowest-wage, highest-violation industries. Third, in order to ensure that these new rights make a meaningful difference in workers’ lives, the City should establish a Mayor’s Office of Labor Standards to educate employers about their obligations, investigate complaints by workers that employers are violating the law, and bring enforcement actions in particularly egregious cases. Fourth, New York City should pass a resolution urging the State to modify the City’s home rule authority so that the City can set a minimum wage that is higher than the state minimum, reflecting the high cost of living here. Minimum standards in the workplace have always been resisted by much of the business community. One hundred years ago, opponents said that prohibitions on child labor and basic workplace safety laws would harm consumers. In the 1930s, they said that minimum wage and hour laws would cost jobs. And throughout the civil rights era, they said that anti-discrimination laws would destroy free enterprise and the autonomy of business owners. But today these laws are indelible and uncontroversial features of our economy. The same can be true of paid sick leave, predictable and fair scheduling, and a living wage for everybody. When standards are raised and all businesses are required to take a higher road, New Yorkers will enjoy more broadly shared prosperity and a more just society. We sit at a pivotal moment in New York City’s history. And as low-wage workers across the City have made clear with their growing movement for change, we must take this unique opportunity to build a City that provides opportunity and economic security for all New Yorkers.